-eliminate all risk of further flight cancellations, because slower growth creates lots of spare aircraft and crews across Ryanair’s 86 bases this winter. -roster all of the extra pilot leave necessary in Oct, Nov and Dec to meet the IAA’s requirement to complete a 9 month annual leave transition period (April to Dec ‘17) so that Ryanair starts a new calendar leave year from 1st Jan 2018 with no backlog. -roster almost 40% of the annual pilot leave requirement for 2018 in Q1 2018, which removes risk of roster problems recurring next year. -roll out a series of low fare seat sales for winter 2017 confident that there will be no further roster related cancellations. (a) Flying 25 fewer aircraft this winter will result in a number of flight and schedule changes from Nov to Mar 2018. We have less than 400,000 customers booked on these flights, (which affects less than 1 flight per day across our 200 airports over the 5 month winter period), and many of these flights have zero bookings at this time. Less than 1% of the 50m customers Ryanair will carry this winter are affected and every one of these customers has received an email today giving them between 5 weeks to 5 months notice of these schedule changes, offering them alternative flights or full refunds of their airfare. They have also received a €40 (€80 return) travel voucher which will allow them to book – during October – a flight on any Ryanair service between October and March 2018. (b) We have also emailed each of the 315,000 customers whose flights were previously cancelled over a 6 week period in Sept and Oct. (Ryanair carries 15m customers every 6 weeks) We have offered each of these customers a €40 travel voucher (€80 return), again for travel between October and March 2018. This flight voucher is in addition to the flight re-accommodation/refunds they received last week, and applicable to the EU261 compensation which they may claim and receive over the coming weeks. (Note: €40 per seat exceeds Ryanair current ave. fare). (c) For the other 99% of Ryanair customers who are unaffected by these flight cancellations and schedule changes, this slower rate of growth means that from today there is no risk of further roster related flight cancellations. These measures have already restored Ryanair’s industry leading reliability and punctuality. Customers will also enjoy lower airfares, as Ryanair responds to last week’s rostering failure, by rolling out seat sales over the coming days and weeks. This starts this weekend with a 1 million, €9.99 one way, seat sale for travel in Oct, Nov and Dec.
(a) We appreciate the widespread support we have received from our 4,200 pilots over the past weeks. Hundreds of pilots, and many of their ERC’s have been in regular contact with the airline offering to work days off, to work one week of their allocated month of leave, and offering to go public to correct the false claims made about them, and Ryanair, by competitor airline pilots in certain media outlets. We appreciate their professionalism which has meant that since last Monday (18th) Ryanair has operated over 16,000 flights with only 3 cancellations, and over 96% of all first wave flights departing on time. (b) This slower growth will provide stability to pilot rosters from November to March. We will not need pilots to give up one week of their well-earned annual leave from Nov. onwards. Slower growth creates a large surplus of standby pilots so we can allocate all annual leave due in the 3 months to December, and more again in Q1 of 2018. (c) We have communicated these changes by email to Ryanair pilots today. We have assured them that all their annual leave is protected. This now eliminates the roster problems this winter, because slower growth means we no longer require our pilots to reorganise their annual leave. We are implementing a €10,000Capts/€5,000F.O. base supplements at Dublin, Stansted, Berlin and Frankfurt from 1st October as we agreed these pay increases with the 4 base ERC’s at recent meetings. We received requests from a number of other ERC’s who wish to discuss these issues, and we have agreed to schedule meetings with these ERC’s over the coming months. (d) We will not respond or accede to anonymous demands made via unsigned emails for group or regional meetings, or for union interference at these internal ERC meetings. Many of our pilots and ERC’s have confirmed that these unsigned letters were drafted by pilots/unions of competitor airlines who wish to pursue an industrial relations agenda at the expense of Ryanair and its pilots. (e) We have also written to our pilots to correct last week’s false claims made about our pilot recruitment. In the current year under 100 Captains have left (mainly to retirement or long haul airlines) and less than 160 F.O’s (mostly to long haul airlines). Over the next 8 months Ryanair has recruited and will train over 650 pilots not only to replace these leavers/retirees but also to crew up for the 50 new Boeing aircraft we will buy to May 2018 to bring our fleet to 445 for S18. Contrary to false claims of pilot shortages, Ryanair has in recent weeks seen a big surge in pilot applications from Gulf carriers and in Germany and Italy where both Air Berlin and Alitalia are in bankruptcy and hundreds of their pilots are facing job losses or steep cuts in their pay and conditions. (a) This slower rate of growth will slightly reduce our traffic this year and next. Our monthly growth from Nov 17 to March 18 will slow from 9% to 4%. Our full year traffic of 131m will now moderate to 129m, which is 7.5% up on last year. By slowing our summer 2018 fleet growth from 445 to 435 aircraft, we expect traffic to March 2019 will slow from 142m to 138m, a 7% rate of growth. (b) The total cost of the flight cancellations last week should be under €25m. We expect the cost of the free flight vouchers issued today to affected customers will be less than €25m. We expect slightly lower yields over the next two months as we promote seat sales. We do not expect these initiatives to alter our current year guidance of between €1.40bn to €1.45bn PAT. We will provide a full update on these issues to shareholders during the half year results in late October. We have rearranged our pilot recruitment and rostering function and will invest in more rostering resources to ensure this failure cannot recur. The 13,000 highly skilled aviation professionals in Ryanair continue to deliver Europe’s lowest air fares to a growing and loyal customer base of 129m passengers p.a. This, over 30 year record of exceptional delivery, will continue but only if we learn from this mistake and work hard to ensure it never happens again. In order to focus on repairing this rostering problem this winter, Ryanair will eliminate all management distractions starting with its interest in Alitalia. We have notified the Alitalia bankruptcy Commissioners that we will not be pursuing our interest in Alitalia or submitting any further offers for the airline. “We sincerely apologise to those customers who have been affected by last week’s flight cancellations, or these sensible schedule changes announced today. While over 99% of our 129m customers will not have been affected by any cancellations or disruptions, we deeply regret any doubt we caused existing customers last week about Ryanair’s reliability, or the risk of further cancellations. From today, there will be no more rostering related flight cancellations this winter or in summer 2018. Slower growth this winter, will create lots of spare aircraft and crews which will allow us to manage the exceptional volumes of annual leave we committed to delivering in the 9 months to Dec 2017. We will start a new 12 month leave period on the 1st of Jan 2018 in full compliance with EU regulations and the IAA’s requirements. We plan to grow more slowly (4% instead of 9%) this winter, by flying fewer of our 400 aircraft between November and March 2018. How will I know if my flight between November and March is affected by these changes? You have received an email notice from Ryanair today (Wednesday 27th Sept) advising you of any flight changes, and offering you alternative flights or a full refund. If you have not received an email from Ryanair today then you are among the 99% of customers whose flights will be unaffected by these changes. Why is Ryanair going to grow more slowly? Ryanair has grown rapidly over 30 years to carry 129m customers p.a. more than any other EU airline. However, it suffered a roster failure in September because it has over allocated months of pilot annual leave during the 4 months from Sept to December. Why not allocate less annual leave? Because Ryanair agreed with the IAA to operate a 9 month annual leave transition period from April – December 2017 to move from a holiday leave year of April 16 to March 17 to a calendar annual leave year from Jan 18 – Dec 18. Is Ryanair short of pilots? Ryanair with 400 aircraft currently employs over 4,200 pilots a ratio of over 10 pilots per aircraft. Only 4 pilots are needed per aircraft per day. Is Ryanair struggling to recruit pilots? Ryanair has more than 2,500 pilots on a waiting list hoping to join Europe’s No. 1 airline. We have offered jobs to over 650 new pilots who will join us between now and May 2018. Are lots of pilots leaving Ryanair? No in the current year less than 100 of over 2,000 captains left Ryanair (mainly retirements or to long haul airlines) and less than 160 F.O’s who have mainly left to join long haul airlines. What does this slower winter growth mean for customers? Less than 400,000 customers (booked on flights across our 200 airports between November and March will today receive between 5 weeks and 5 months’ notice of schedule changes. They may switch to alternative Ryanair flights or obtain full refund if new flight times/dates don’t suit. They will also receive a €40 one way (or €80 return) travel voucher which they can use in October to book a Ryanair flight for travel between October to March. What have Ryanair done for customers on the 2,100 flights cancelled last Mon 18 Sept? Over 97% of these customers received flight changes or full refunds by Sun 24 Sept. Today these 315,000 customers have also received a €40 travel voucher (€80 return) to book a Ryanair flight between October to March 2018. Is there “flight chaos” in Ryanair? All flights are operating normally. Over the past week from Tues 19 to Mon 25 Sept Ryanair operated over 16,000 flights with over 96% of first wave departures on time, and just 3 flights cancelled (due to 1 runway closure and 2 adverse weather diversions). How many flights did Ryanair cancel in Sept/Oct due to this rostering problem? 2,100 of our over 800,000 annual flights. How many flights will be schedule changed over the 5 months Nov to March to meet this slower growth plan? Less than 18,000 of our 800,000 annual flights. This is less than 1 flight per day per airport across our 200 airports over the 5 month winter period. Many of these flights, especially in Jan, Feb and March have no bookings whatsoever. How many customers have been affected by todays schedule changes? Less than 400,000 of Ryanair’s 129m customers in the current year. Over 99% of Ryanair customers have been unaffected. What effect will slower growth have on Ryanair pilots? It will create 25 more spare aircraft and more than 100 daily extra standby pilots from November to March. It means all calendar months of pilot leave will now be secure and Ryanair will not require pilots to reorganise their annual leave. How many Ryanair pilots have a calendar month of leave to take before December? Will this A/L rostering problem recur in 2018? No because A/L will be allocated over a full 12 month period in 2018. Has there been management changes in the pilot rostering area? The pilot recruitment and rostering function has been taken over by Ryanair’s Chief People Officer who will over the next 6 months hire more rostering managers, schedule the training of the 650 pilots Ryanair has already recruited to fly Ryanair’s S18 fleet of 435 operating aircraft, and meet with ERC’s and pilots to address their concerns. How much will the 2,100 cancellations cost Ryanair? The refunds and EU261 costs will cost Ryanair under €25m while we expect the free flight vouchers will cost less than €25m. Have all affected customers been advised of these winter schedule changes? Yes, all affected customers have received email notifications today. Are these schedule change customers entitled to EU261 compensation? No as these schedule changes have been made with 5 weeks to 5 months of advance notice, EU261 compensation does not arise. Will this slower growth affect Ryanair traffic numbers? Ryanair will now carry over 129m customers in the year to March 2018 (previously 131m) and in the year to March 2019 growth will slow from 142m to 138m customers. Will fares rise as a result of this slower growth? Ryanair will keep reducing fares. A series of seat sales will roll out over the next few months starting with a 1 million seat sale this weekend at fares from €9.99 one way. 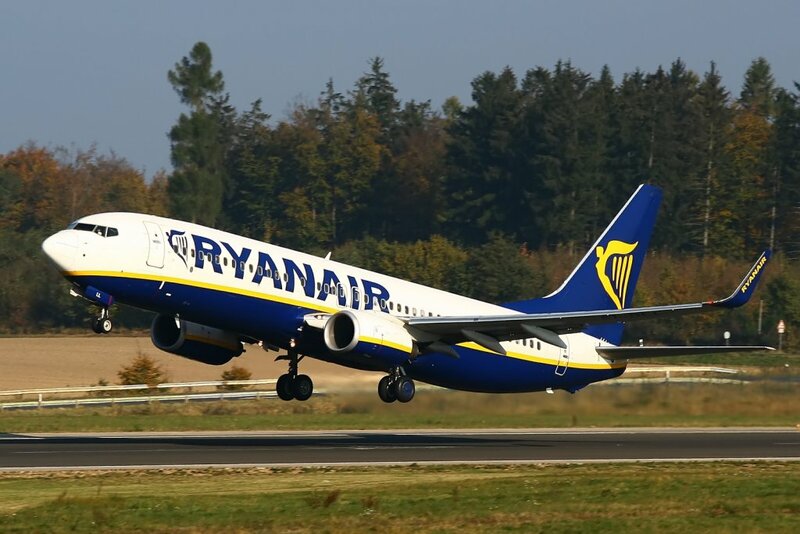 Will slower growth affect Ryanair profits? Ryanair expects its full year PAT forecast of €1.40bn to €1.45bn to remain unchanged. Although over the next two years as Ryanair hires more pilots and raises pilot pay, costs will rise slightly but we don’t believe this will impact profitability. Will Ryanair be doing anything more for its pilots? We have already agreed €10,000/€5,000 pay increases with our pilot ERC’s (Employee Representative Committee) at Dublin, Stansted, Frankfurt and Berlin. Ryanair has also received requests from other base ERC’s for meetings to discuss pay and conditions and will be arranging these meetings over the coming months. Will Ryanair meet with other airlines’ pilots or pilot unions? Ryanair only meets directly with its people. It will not meet with competitor pilots or their unions. Will there be any more cancellations? This slower growth means we will have surplus spare aircraft and pilots all winter and in summer 2018. In the last week we operated over 16,000 flights with only 3 cancellations, 1 due to a runway closure and 2 adverse weather diversions. How do I know if my flight has been affected? You will have received a schedule change email from Ryanair either on Mon 18 Sept or today Wed 27 Sept. 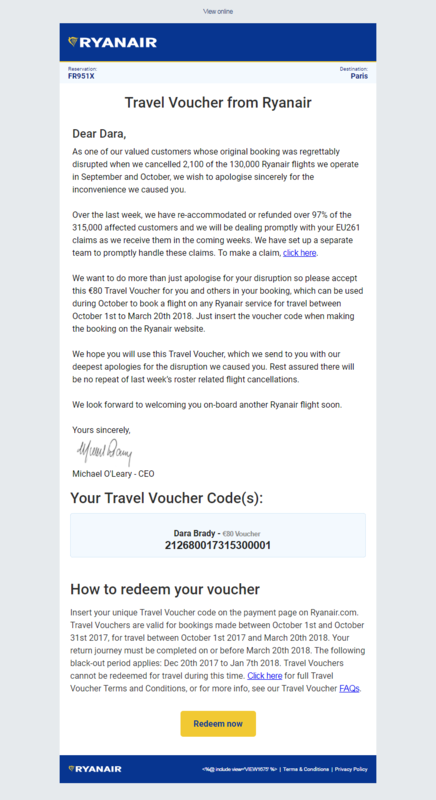 If you have not received an email notification from Ryanair then you are one of the 99% of customers unaffected by these cancellations or schedule changes. Do Ryanair pilots suffer low pay or poor working conditions? Captain’s earn between €120,000 to €180,000 p.a. At Dublin and 3 other bases this has recently increased by €10,000 p.a. Pilots by law cannot fly more than 900 hrs p.a. Will Ryanair slow down its aircraft orders? We will buy 50 new Boeing 737 aircraft between Sept 17 and May 18. We buy 20 aircraft from Boeing in the winter of 2018/19. Will Ryanair be meeting directly with its pilots? We normally meet with our 86 Pilot base ERC’s each winter. These meetings have already started and agreed pay increases (base supplements) at Dublin, Stansted, Berlin and Frankfurt bases. We are now scheduling meetings with other bases as individual pilots and ERC’s have requested meetings. Will Ryanair hire more pilots? We plan to increase our pilot recruitment over the next 12 months from 5.2 crews (10.4 pilots) per aircraft to 5.5 crews (11 pilots) per aircraft. We will also need to hire fewer pilots in the winter of 2018/19 because of a timing gap between aircraft orders, when we only take delivery of 20xB737 aircraft between Sept 18 to May 2019 instead of the usual 50 aircraft deliveries this winter. Is there a list of routes that are suspended from November for the winter following these 25 aircraft groundings? All other of Ryanair’s 1,800 routes will continue to operate for the winter. Some have had schedule changes but customers have been offered alternative flights on their chosen route or a full refund.